Strawberries – 4th of July style! | Let's Eat! Strawberries – 4th of July style! Always a favorite on the 4th of July!! In honor or the 4th of July! 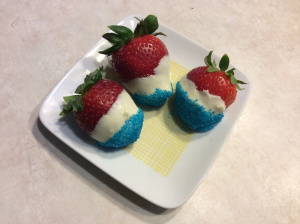 Independence Day strawberries! Visit http://www.sundaywithachanceofmeatballs.com for more great recipes!